Click HERE to view part one. Setting up the rig for the first time. I hauled the as yet unfinished spars out to the club to set up on the boat. 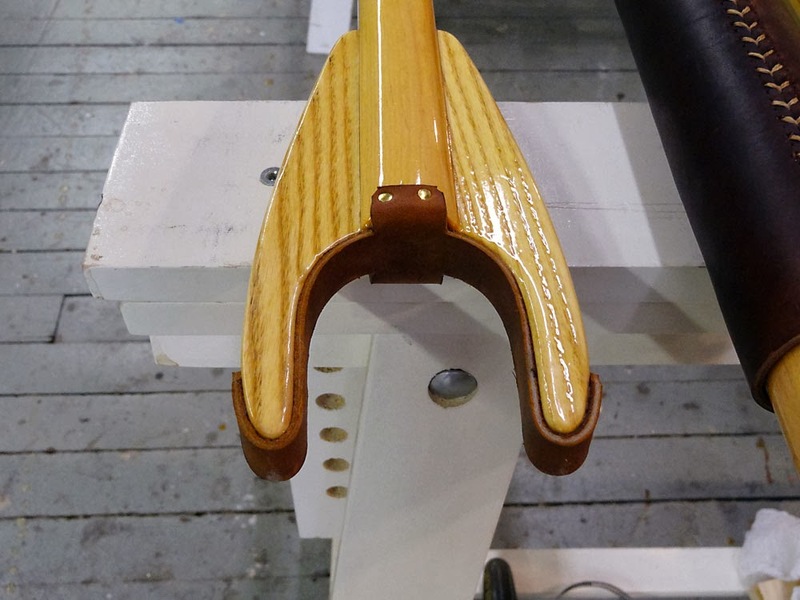 I wanted to locate all of the cleats and fairleads and what-not, and locate the leather chafe guards before varnishing, and I wanted to get it right. I spent most of a whole day setting up the rig, trying various boom and yard positions, relative to hoist and downhaul points. Since I designed my own rig, I didn't have any tried, true, and tested set of drawings to go by, only my own sketch with some basic dimensions. I moved the boom fore and aft quite a bit, looking for the best position overlaying the mast. I decided on a position for the both the boom and yard that set the luff more or less parallel with the mast, and that put the clew end of the boom high enough for head clearance. On a lug rig, downhaul tension is everything. When first set up, I was using just a spare block or two to get me in the ball park, but making a list of the parts that I still need to order. I didn't have enough purchase on the trial setup to get good luff tension, so we had a little wrinkle from the clew to the head. 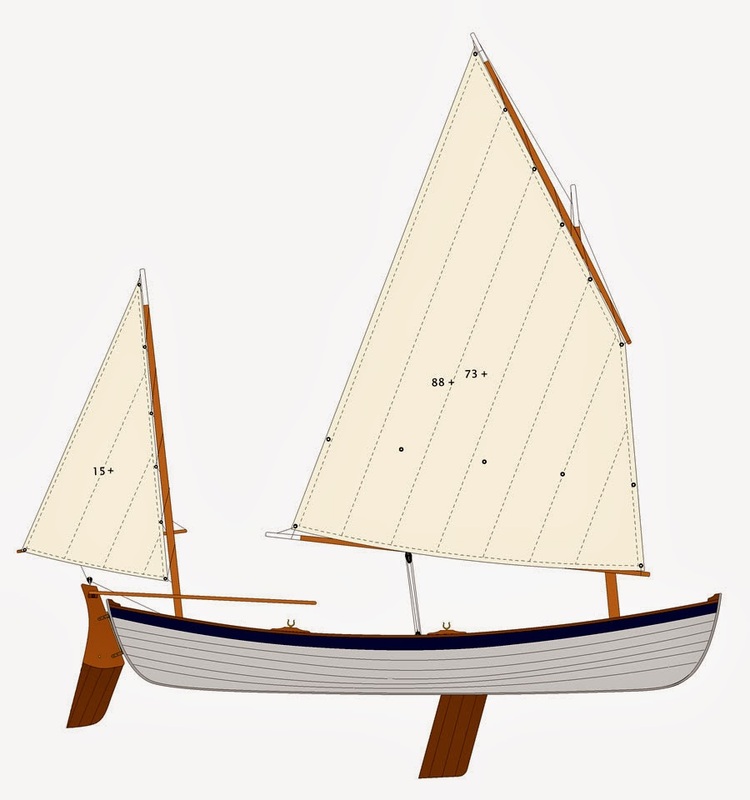 When I was satisfied with the sails, I marked all of the pertinent locations for line attachments and cleats, and made some sketches so that when I had the spars back in the shop I would know just what to do. I placed an order for all the line, blocks, and doo-dads I would need, and set to work back in the shop. I tried to make as many of the fittings as I could, including various horn cleats, jam cleats, and bee blocks (for lack of a better word). 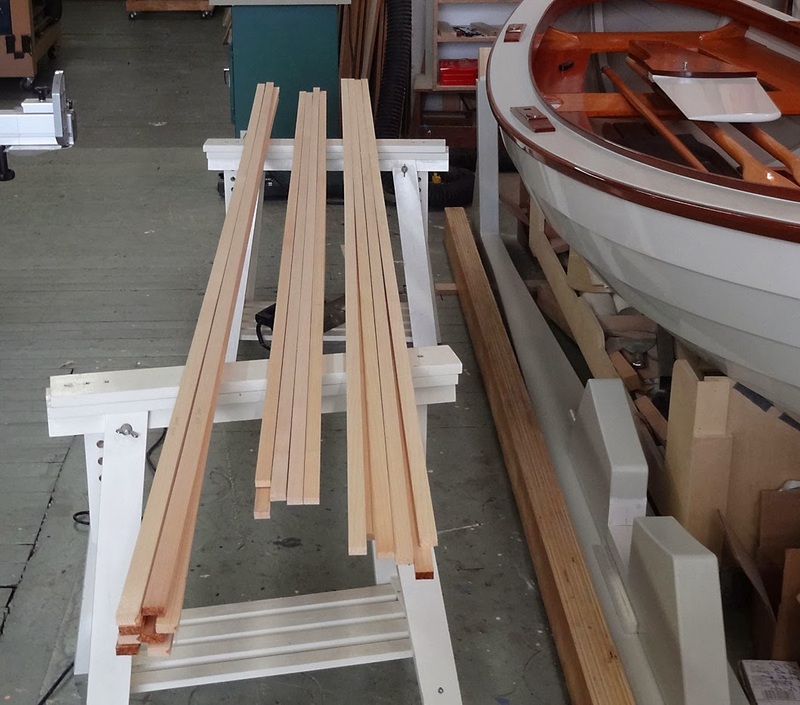 My plan was to glue most of the hardware into shallow mortises in the spars. I did not want to use screws in the hollow sticks, because I would need solid blocking in those locations, and there are a lot of them. Rather than to have to plan out every location in advance and install the blocking, I opted for the shallow mortise. 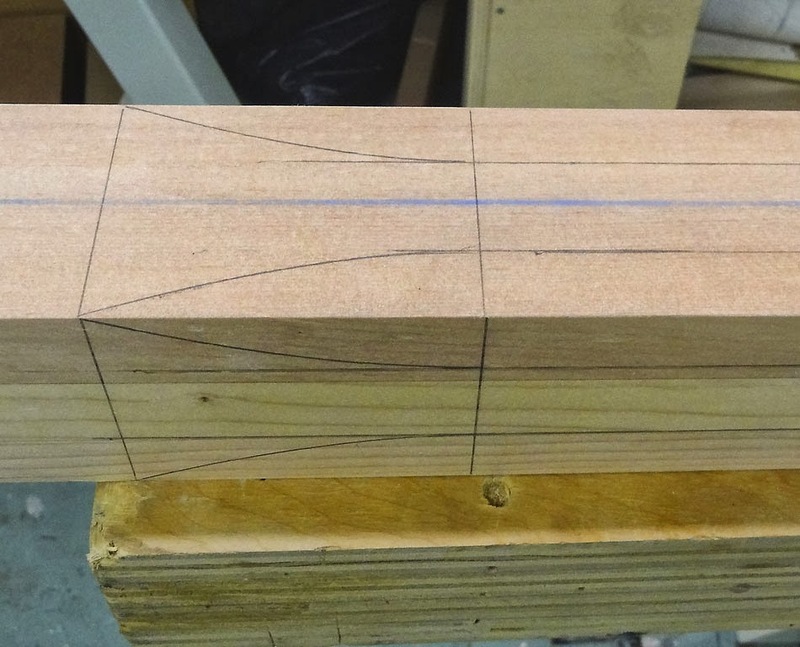 I laid out patterns for the various cleats, making sure to include extra depth at their bases for the mortise, then cut the many fittings out from scrap ash that I had in the shop, fairing them up and shaping the edges with chisels, files, and rasps. I sealed all of these with shellac, then began gluing them in the mortised spars, using blue tape for clamps. I then moved on to varnishing, putting on a coat each evening for several days. 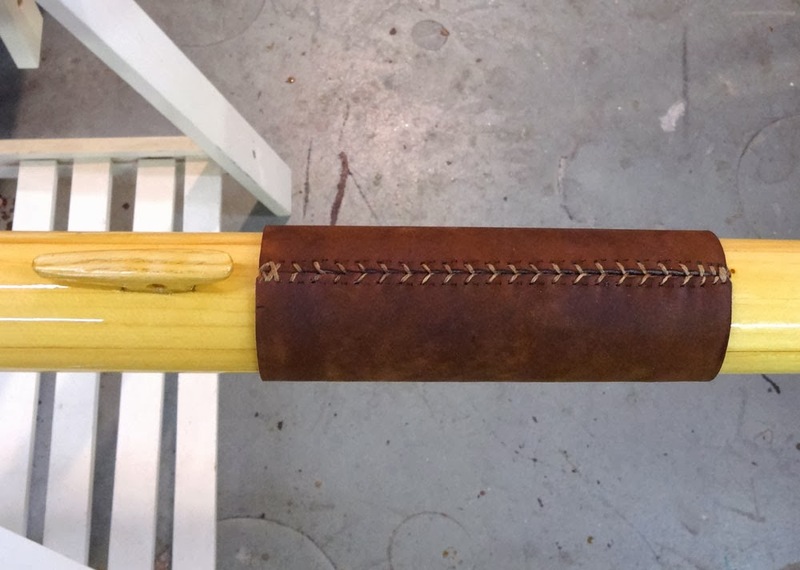 Cleat layout on ash stock. A pile of cleats and bee blocks, ready to install and varnish. 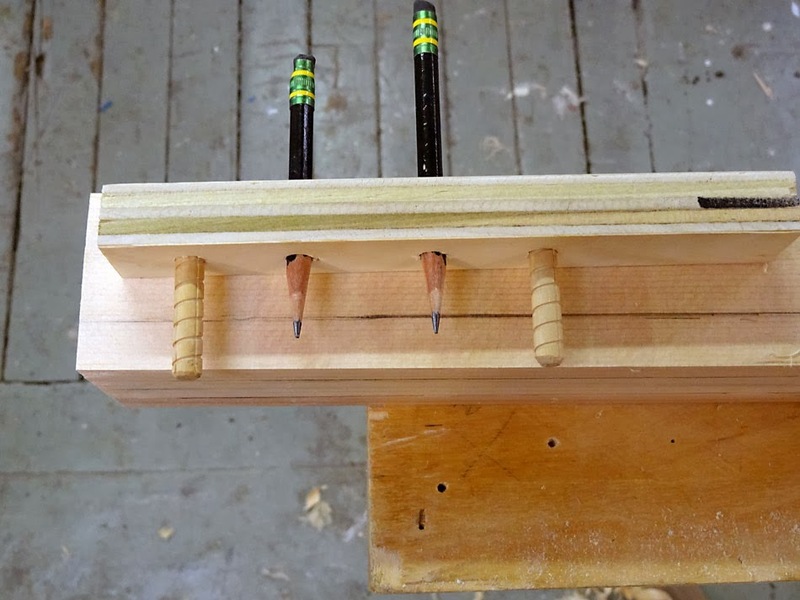 I glued the cleats into shallow mortises. 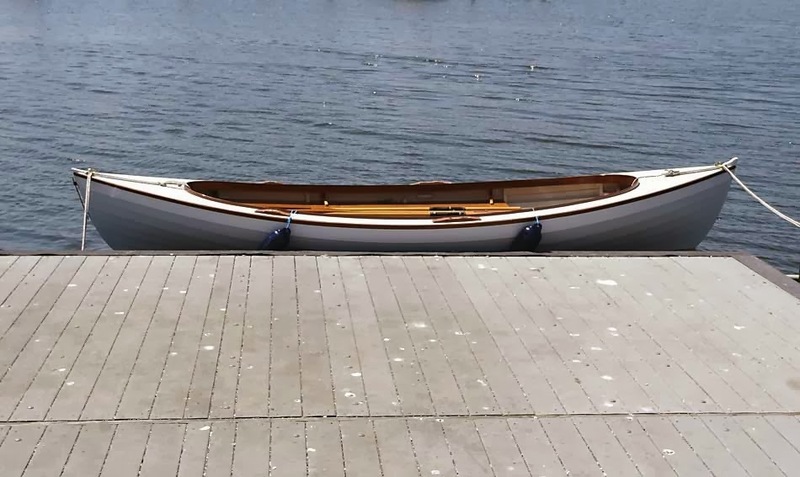 Once the cleats were on and the spars were varnished, I fitted the various chafe guards, using scraps of leather from the KikaNY shop down the hall. One day, Kika, I swear I'll buy a hide of my own! I went out and bought a nice little punch for the stitching. This punch has tines that are really too close together for my purposes. I really should cut off every other one, but I'll buy another just like it before I do, just in case. 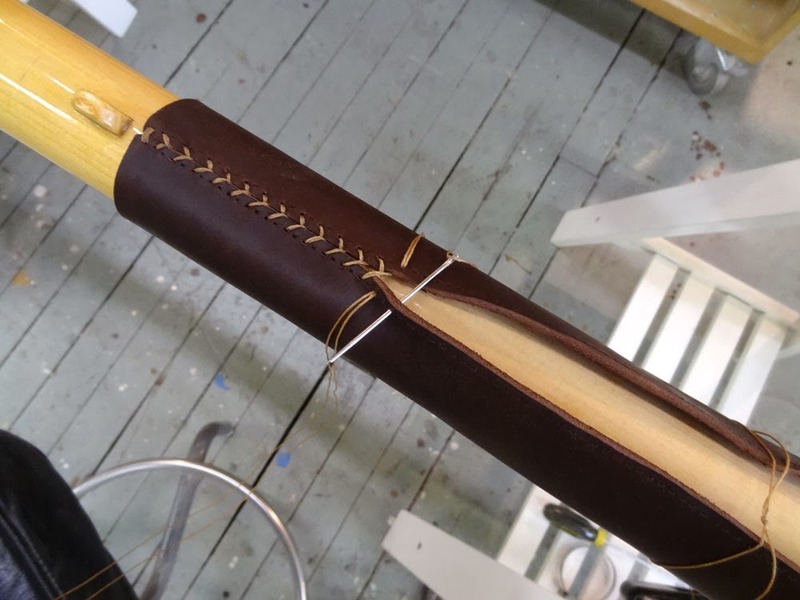 It's tricky to cut the leather the right length, because some space needs to be allowed for stretching, and different hides stretch at different rates, so predicting that is a bit of trial and error. I cut the pieces about 3/16" short of the circumference, punched the holes, soaked the leather in warm water, then stitched them up snugly, using two needles crossing back and forth in a kind of baseball stitch. There is a lot of information out there for this, but I kind of found my own way with it, and I'm pretty pleased with the results. I truly enjoyed this work. You just pull up a chair and go at it. It's kind of a zen zone thing, and nice music helps (probably not Marilyn Manson, though). Finally, all the spars were done! I sanded the varnish for better grip on the leathers. The punch I bought for stitching the leather. The stitching is done with two needles. The guard where the mizzen mast enters the deck. A finished set of spars! 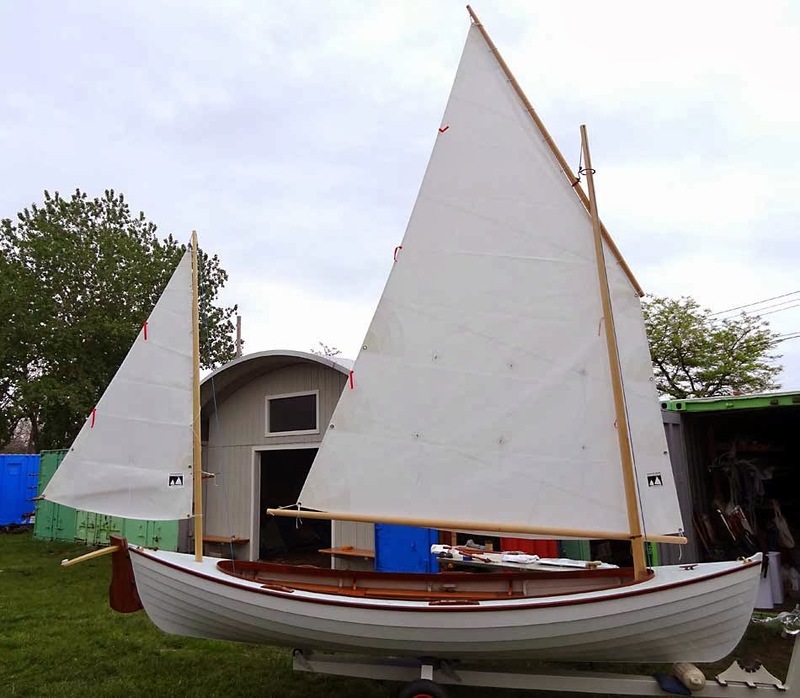 I think it's probably worth a written description of the rigging details for Mouse's lug yawl rig. 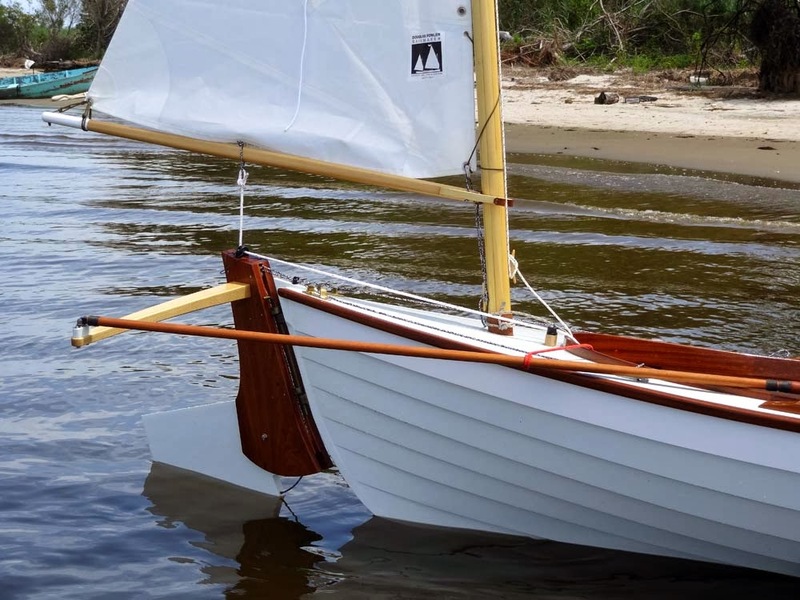 The rig is pretty well understood and documented now, due to its recent widespread popularity among the sail and oar group, but I'll offer my take on it here. The fore is hoisted on a halyard that ties into a mast traveler ring, which slides up and down the mast. There is a rope strop around the yard that slips onto a hook under the ring. I bought a mast traveler from Classic Marine in the UK. The halyard passes through a sheave at the masthead, which runs port to starboard (not fore and aft). 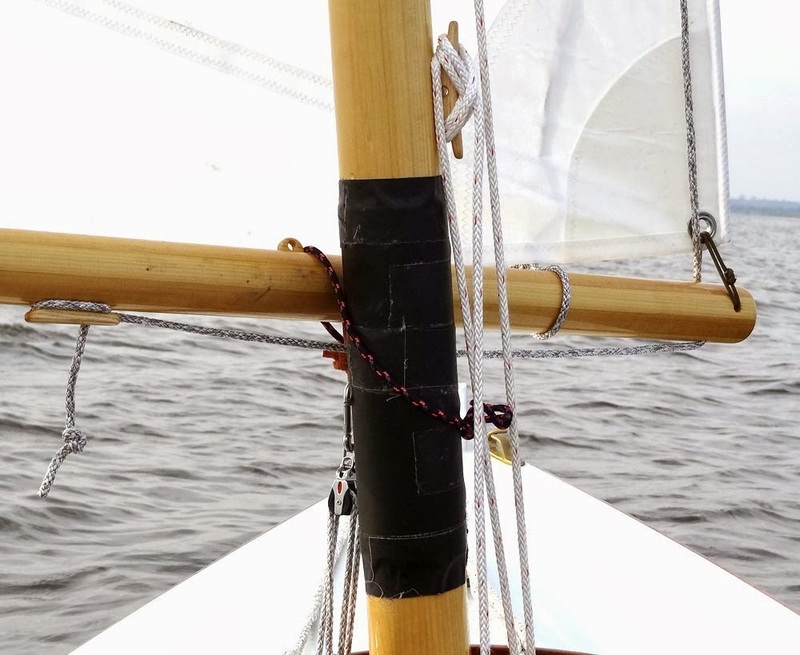 This orientation routes the halyard down the starboard side of the mast, to a block strapped to the mast thwart, then back up to a cleat on the mast. To ship or unship the yard, the strop just unhooks from the traveler. The boom is held to the mast largely by a several part downhaul that tensions the luff, though it is finally secured by a line or some such around boom and mast after hoisting. Some folks use an actual dog collar for this, and I will too when I get to the pet store. In the meantime, I named that line that I use the 'dog collar". When the downhaul is hauled tight, the yard peaks up and the whole rig is under control. Hoisting is a little bit of a fire drill and must be done very quickly. Until set, the yard flails around a bit. 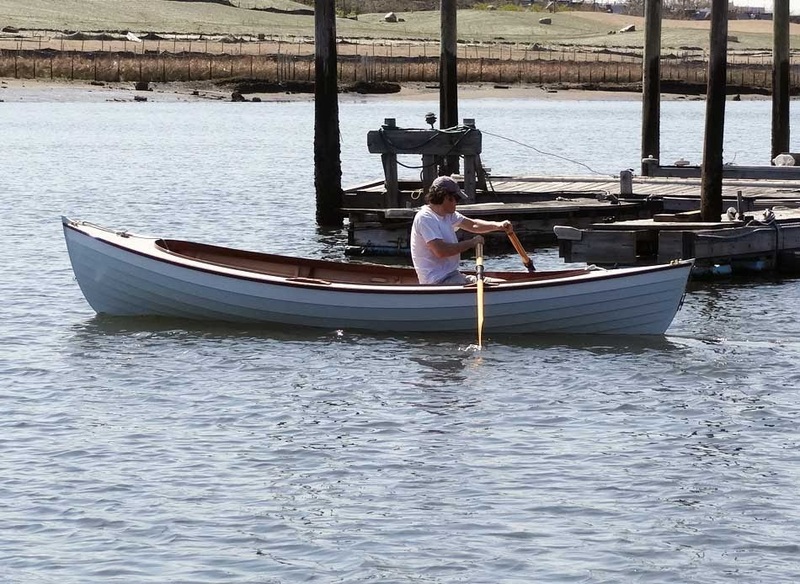 Afloat, this whole scene is made possible by that little mizzen sail, which keeps your nose comfortably upwind. 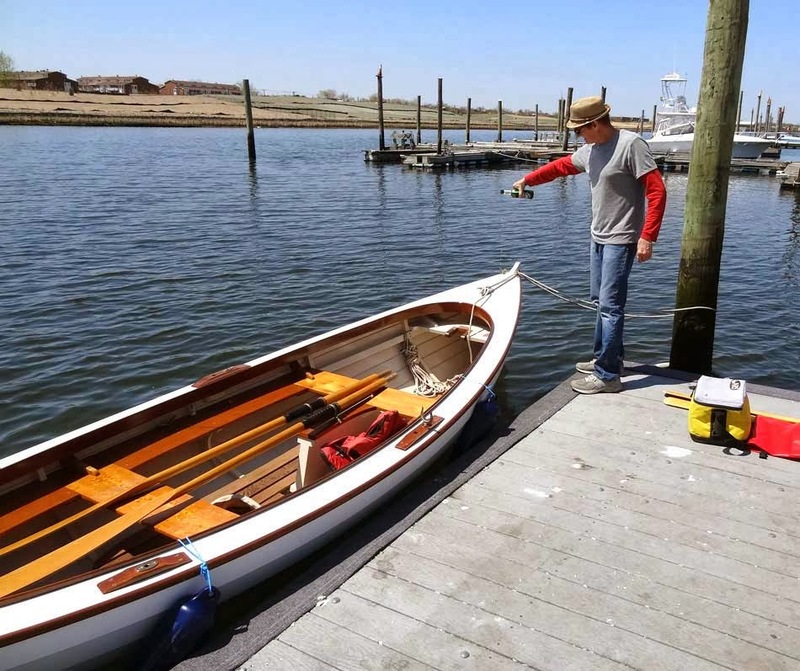 Without the mizzen, the boat will want to start sailing before things are under control, and that would not be fun! This shows the halyard and downhaul arrangement. It's a little messy looking here, but it all works. Close-up view. The mast chafe guard is just taped on here. I didn't have a big enough piece of leather at the time. The downhaul itself clips into another strop on the boom via a carabiner. It's fast to clip on and off. The tackle consists of an old Laser fiddle with v-jam that is strapped to the thwart. On the top there is a double, giving a total 4:1 purchase. That has proved sufficient, though some sailors use even more. The sail is lashed to the yard, but is loose footed at the boom. The tack is simply tied off through a hole in the boom's end. 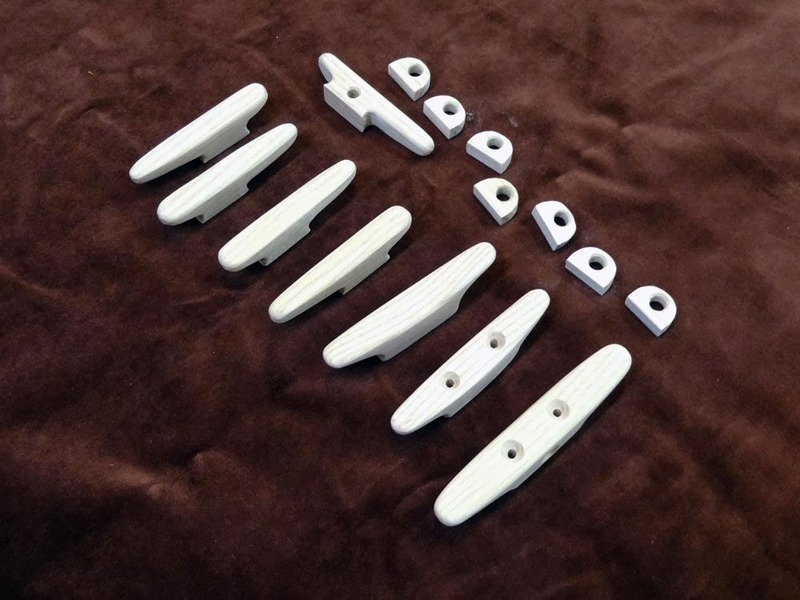 The clew has a line through the grommet that passes around the boom and serves as a traveler. 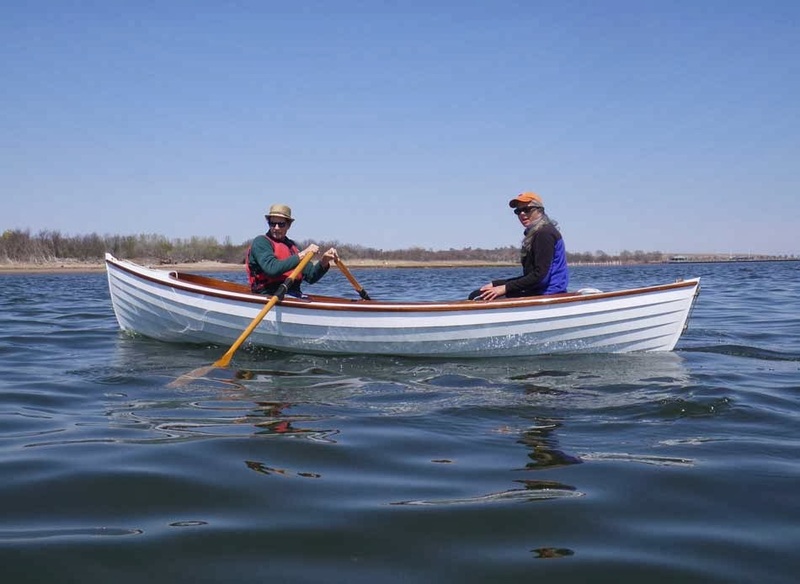 There is an outhaul that dead ends at the aft end of the boom, then passes through the clew grommet and back to a cheek block on the other side of the boom, then to a wood jam cleat up forward a little ways. For reefing at both tack and clew, I dead end a line around the boom with a bowline, go up to a carabiner that clips into the reef grommet (the carabiner has a ring fairlead) then down through a hole (dumb sheave) in the boom and forward or aft to a jam cleat. (Note that when these photos were taken, I had not yet installed the carabiners for the reefing tackles. The line just passes through the grommet.) The clew reef should have an angle aft to automatically tighten the foot. You want a tight outhaul if you are reefed. The sail is neatened up with reef pendants through the grommets as usual. To reef afloat, I haul the mizzen in and let go the helm. The boats sits there roughly head to wind, drifting straight backwards (leave room to leeward). I drop the whole rig into the boat, unhook the downhaul and mast traveler quickly, then tie in the reefs and re-hoist. The only time to hurry is during lowering and hoisting. 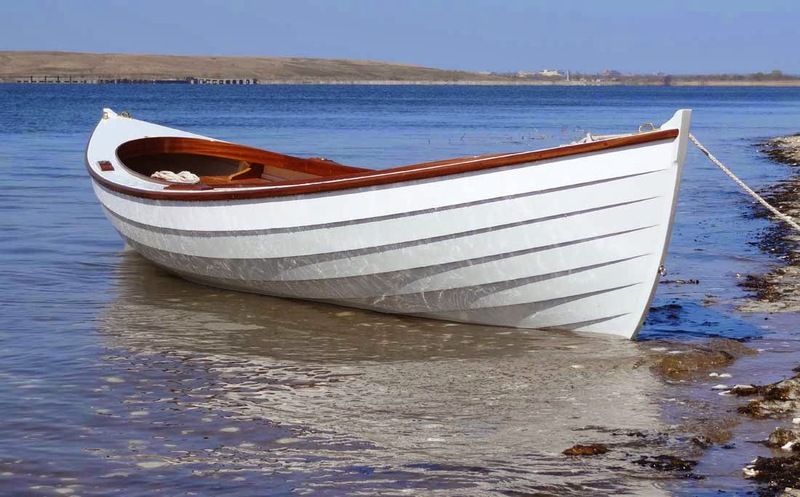 As with anything to do with boats, practice builds confidence. 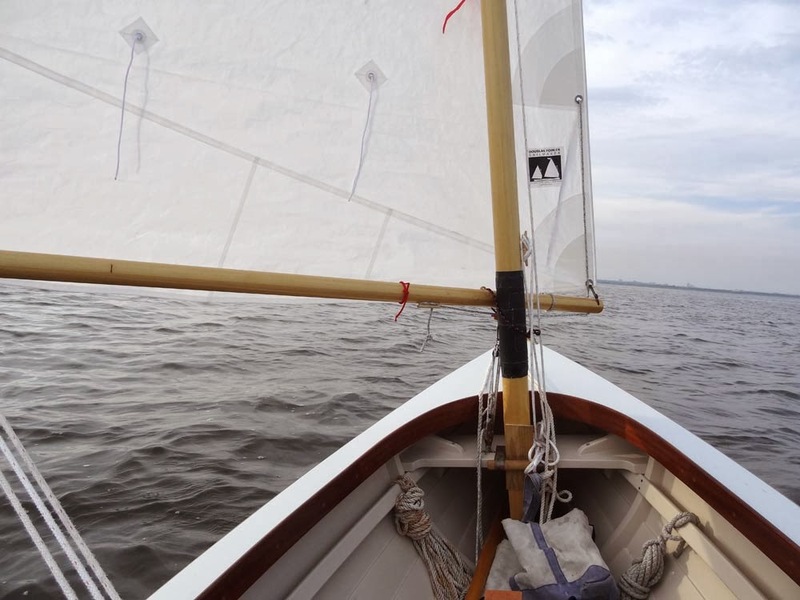 "Finally took a first sail on Mouse yesterday, and could not be happier. 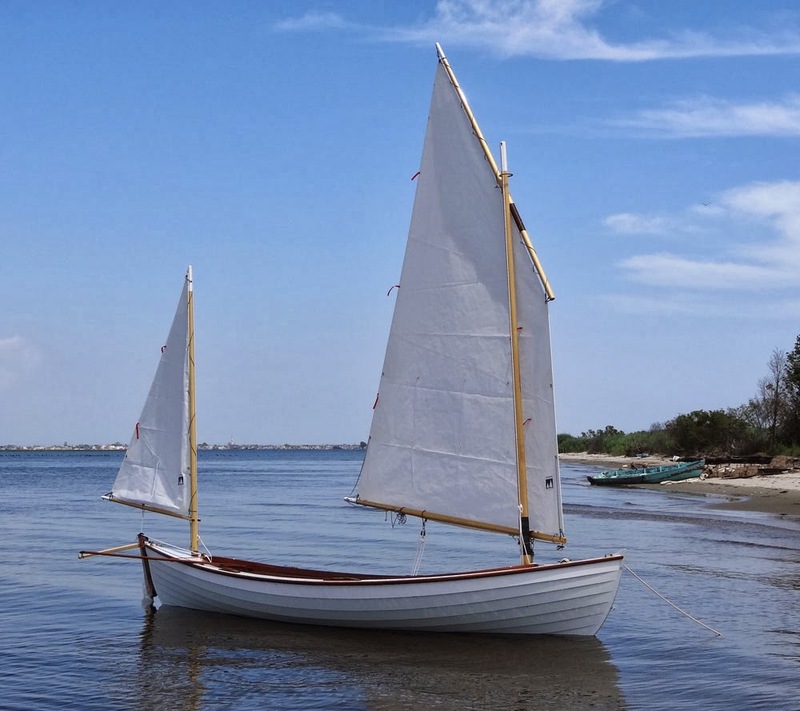 The little mizzen works as advertised, and once I got comfortable with the setup, steering, sheeting the fore, and mizzen was easy and handy. The forecast from I- Windsurf was for light wind (5-7) from the SW, so naturally it blew 14, a little gusty and shifting W to S. The boat is tender (I have expected to ballast all along), so I was a little edgy at first, but heeled down she is quite stiff, and really fast. I'm going to try a couple of sand bags, then add some permanent ballast under the floor boards. I must have got my sums right, the balance is perfect, and I can tweak the helm with an inch or two or three of sheet on the mizzen. I love that little sail. I don't even have to look, as I can hear when it luffs, and feel when it needs freeing up. I led the sheet to a cam on the deck just behind the coaming, on a little ash riser block. I'm quite happy with the lead to the rudder head, too. My location is aft enough on the boom that I can get the sail very close to dead center. At any rate, she heaves to pretty close to dead upwind. I have not yet run a reefing drill afloat, but I'll do that next time out. I tucked into the lee of an island, and reefed there. Did some creek crawling in the marsh at high speed, and she tacks and jibes very reliably. I really had no idea how she would behave. Its a new rig for me, and my own design, so there's lots of ways I could have gone wrong. I had crew with me, but I handled all the stuff myself so I could get a feel for the rig and helm." Well folks, this kind of wraps up my double ender saga, at least for the time being. As I write this, we are in the middle of a series of "polar vortexes" as they say, with temps rollercoastering between 30 and the single digits. 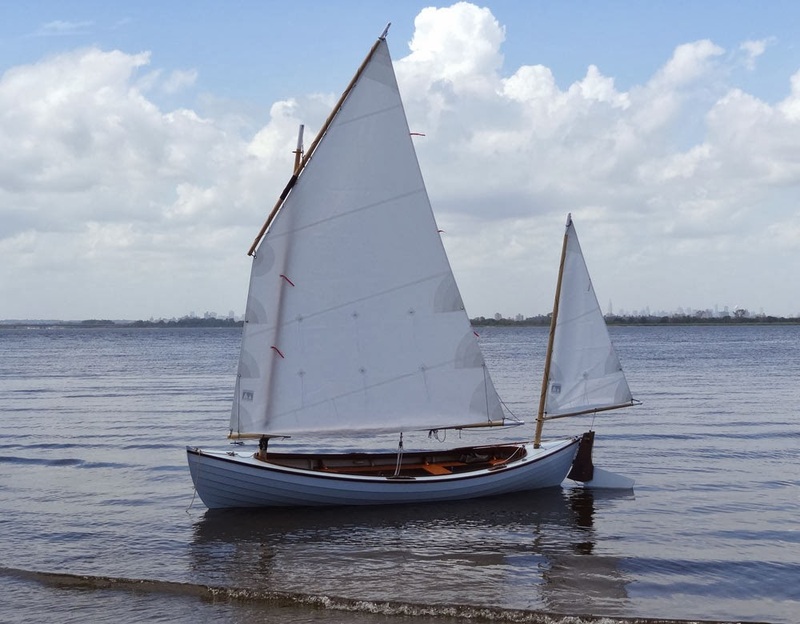 I'm looking forward to next season's sailing, when I can get the rig all tidied up, and a lot more time in the boat. I will post some updates from time to time. Thanks to all who took the time to read and look. It's been fun putting this build to press, so to speak. 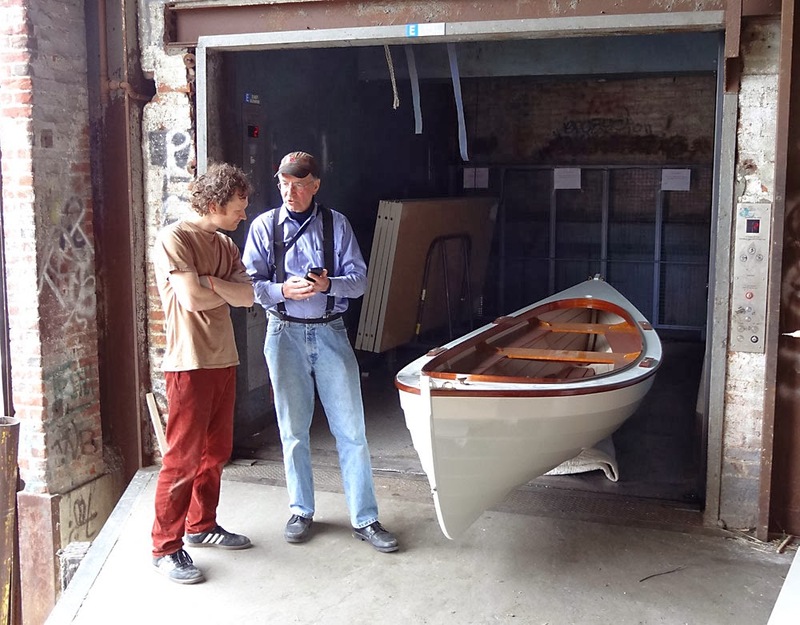 I'm looking forward to continuing this blog with many other boat and boating stories! The original sail plan. Fores'l was increased to 80'. 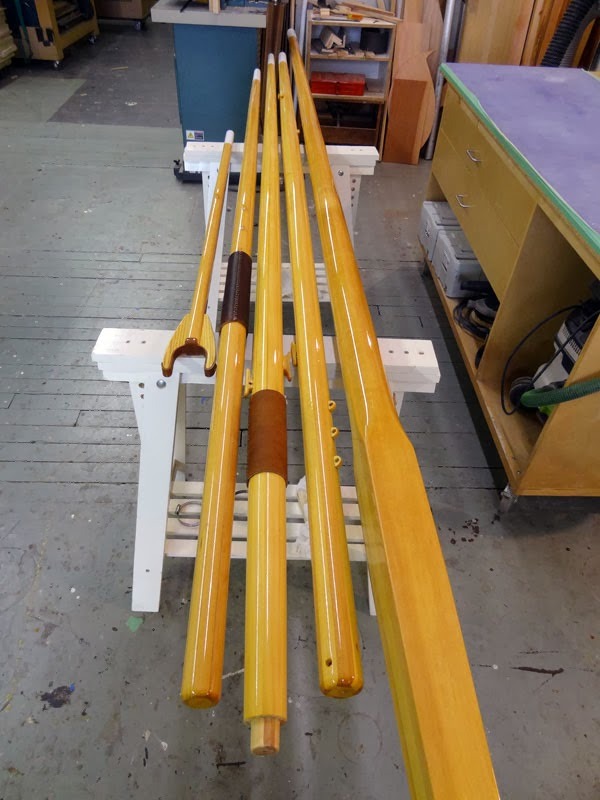 A full set of spars for a lug yawl is a bit of an undertaking. The pieces are not big or heavy, or complex either, but there's a lot of them! 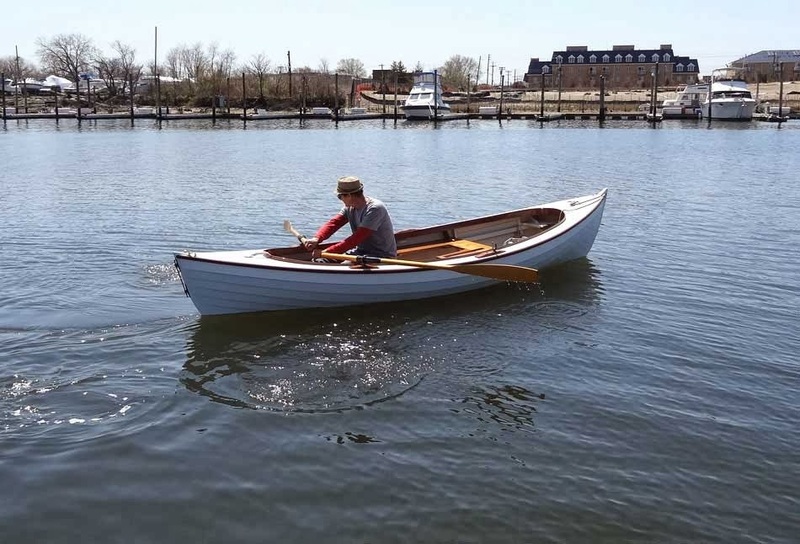 Five for this boat, and it would be six with a boomkin, but I'm tacking the mizzen sheet to the rudder head so don't need that stick. 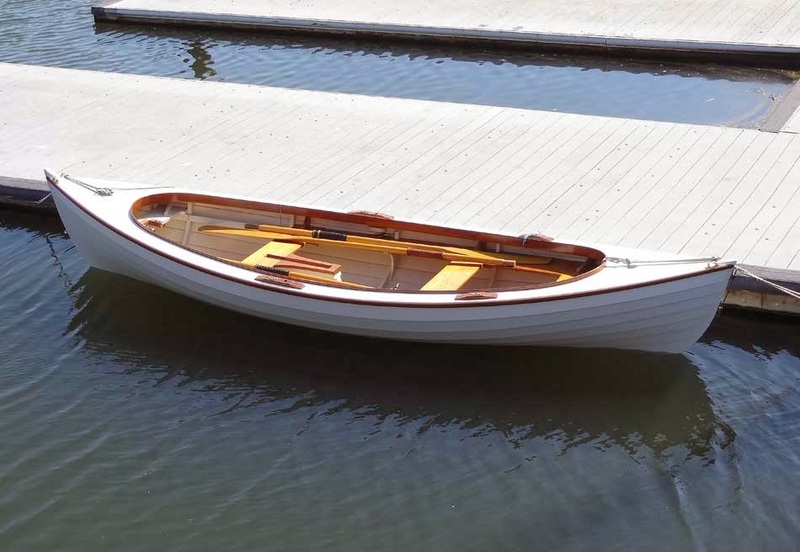 Mouse is a special boat, and not a cheap one, so I went for the best spar grade Sitka spruce I could find at M.L. Condon lumber. I can remember once paying around $2 a board foot for this stuff, back in the 80's. Try $8.50 now! But I picked out some nice sticks. I also had an old mast blank from my Penguin that I cut up and re-purposed. 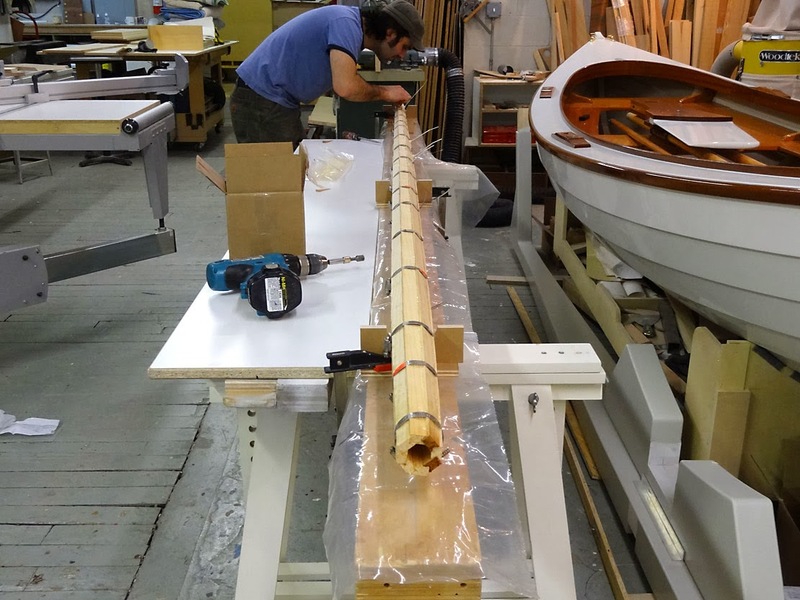 That stock went into the new mizzen mast. 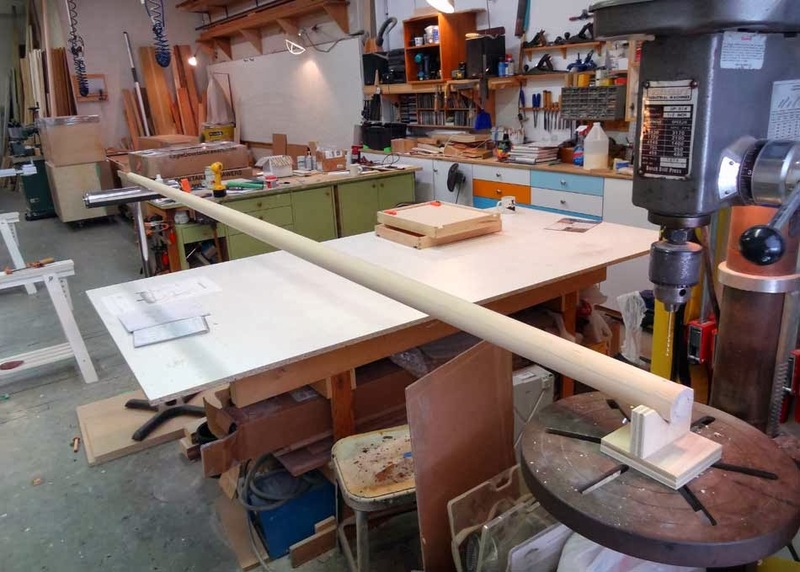 The fore mast is a solid stick, but the rest are hollow birdsmouth, except the mizzen boom which is so small that a hollow construction is not worth the effort. 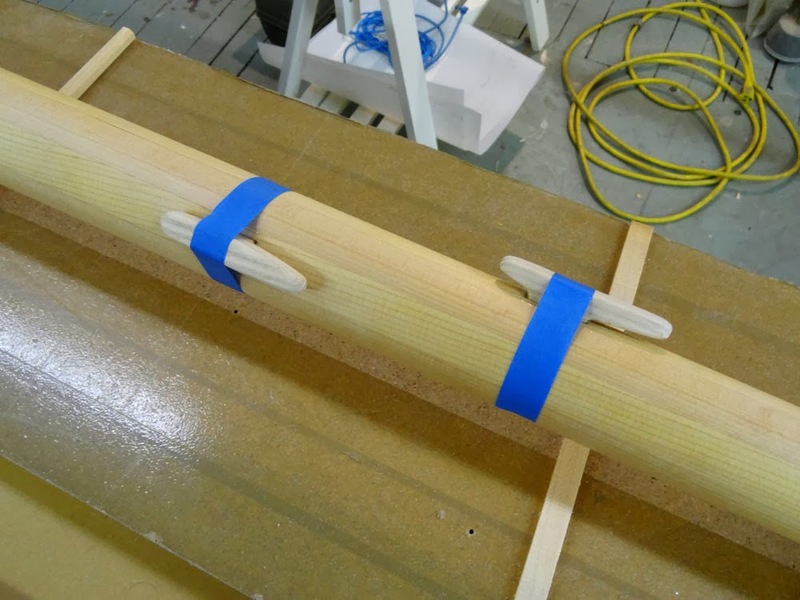 I glued up the fore mast in three pieces of 5/4 stock, dressed to 1-1/8". 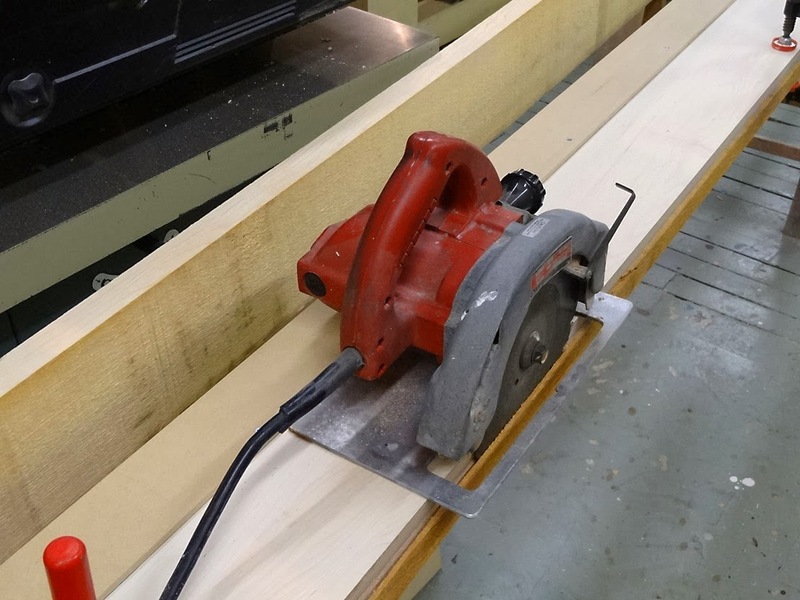 I don't have room behind the jointer for 16' stock, so I trued up the edges with my circular saw and a home made track beam, clamped to the boards along a chalk line. 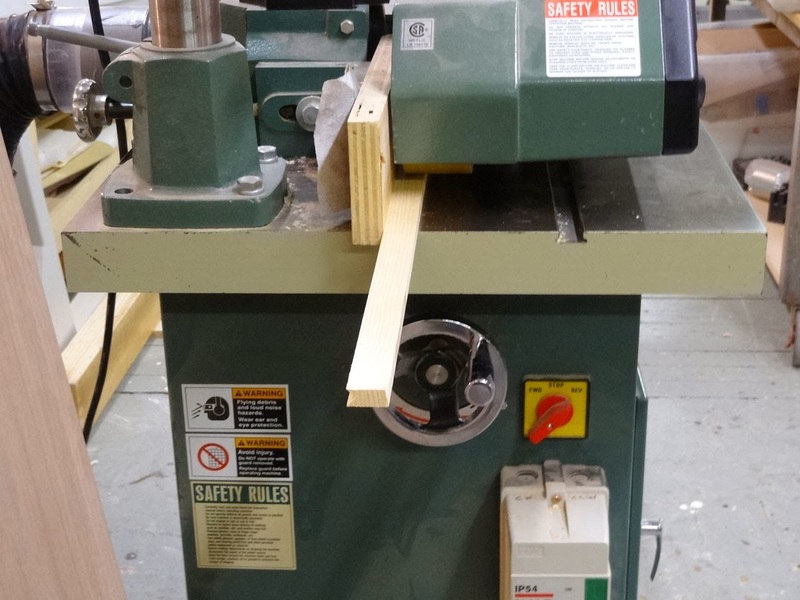 After truing one edge, I ripped the sticks to width on the table saw, then flattened the high spots on one face of each with my fore plane before sending them through the planer. I made a saw track to true the long edges of my spruce. 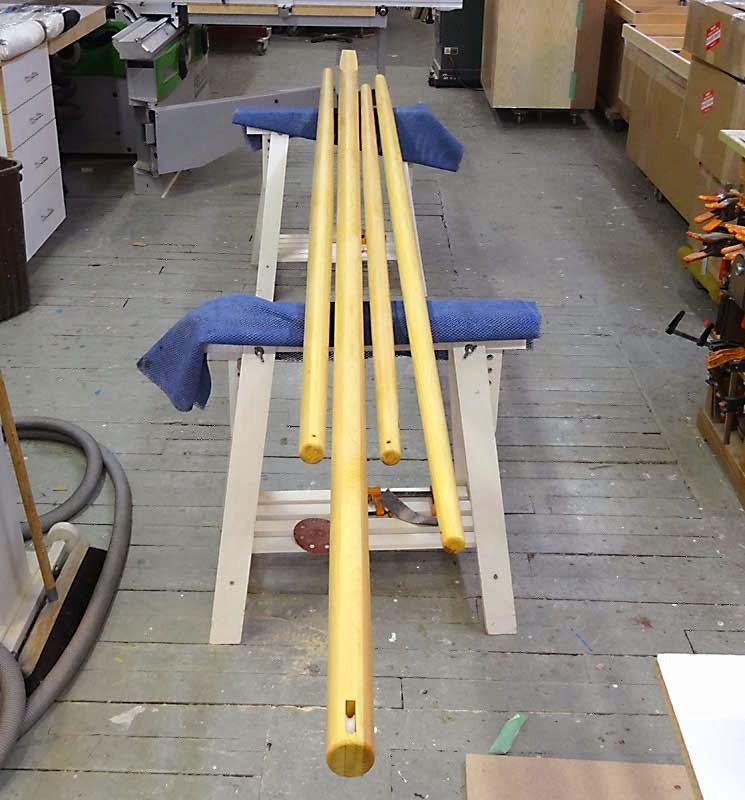 The three sticks for the solid fore mast. After gluing up the blanks, I popped a centerline down the length of each side and laid out the tapers from the center out. 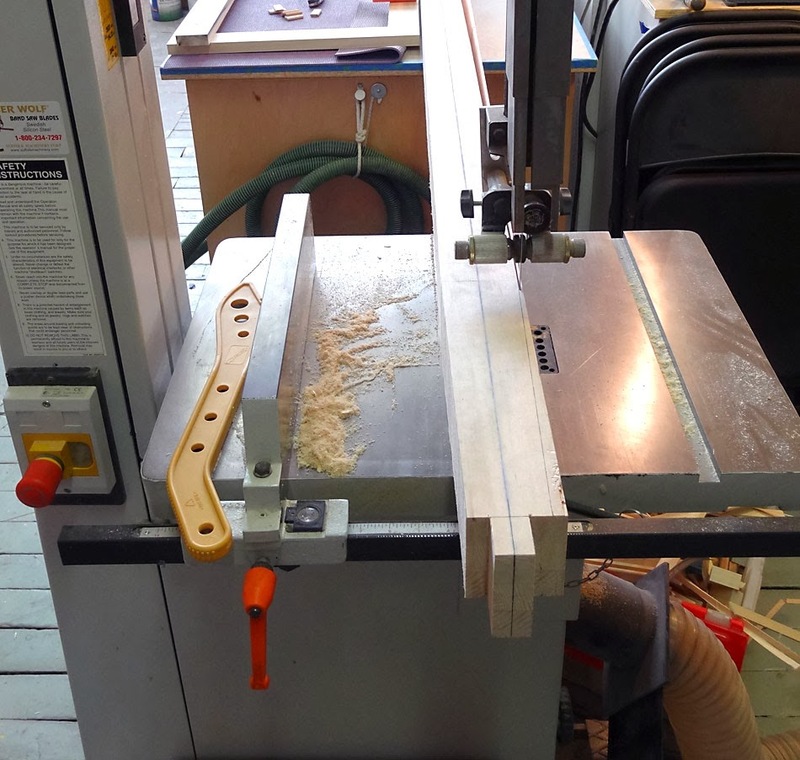 I sprung a batten around the marks for a little parabolic curvature, rather than a straight taper, and cut to the lines on the bandsaw. I trued the faces flat and square before laying out the cuts for eight siding with a little quick and dirty spar gauge. 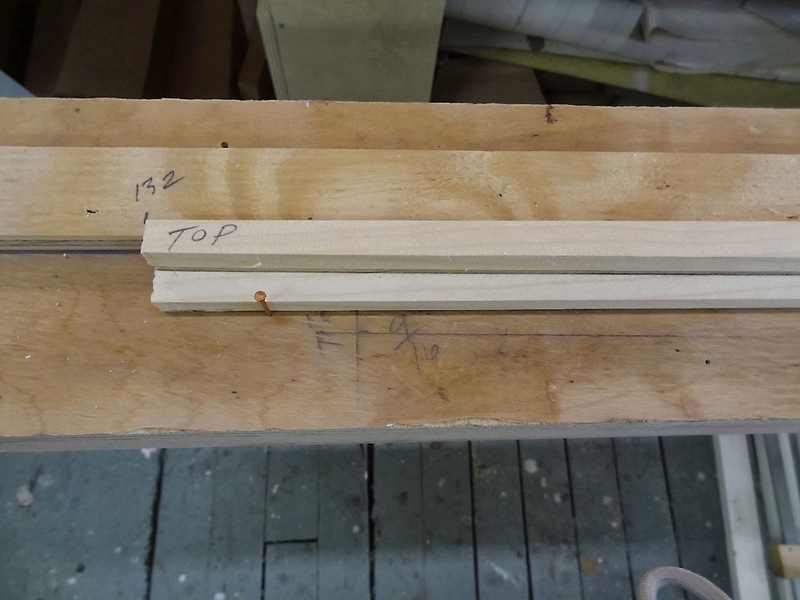 Spar gauge used for laying out the eight siding. 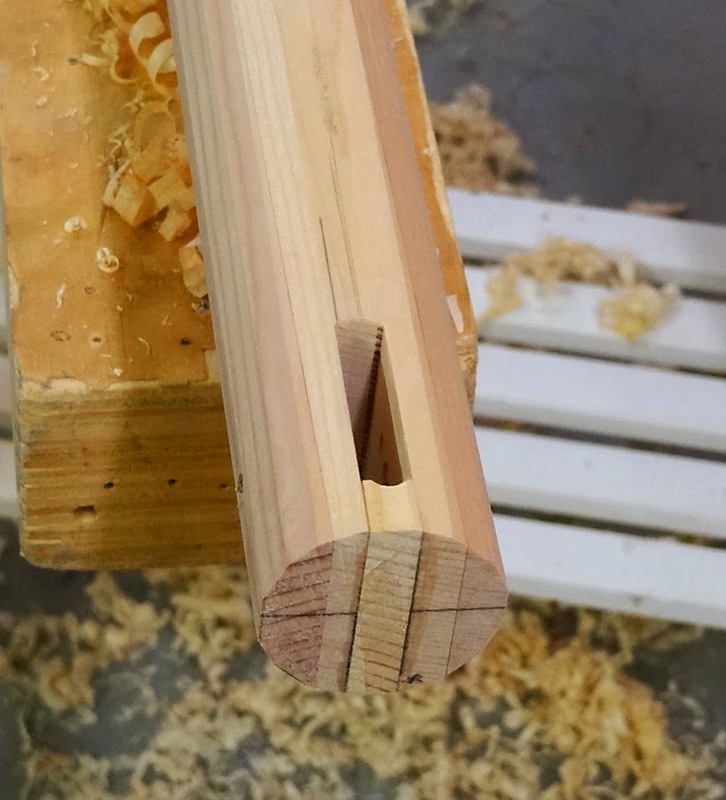 I left the fore mast square in section from just above the partners down to the tenon. The round section fairs into the square with a sort of scallop. 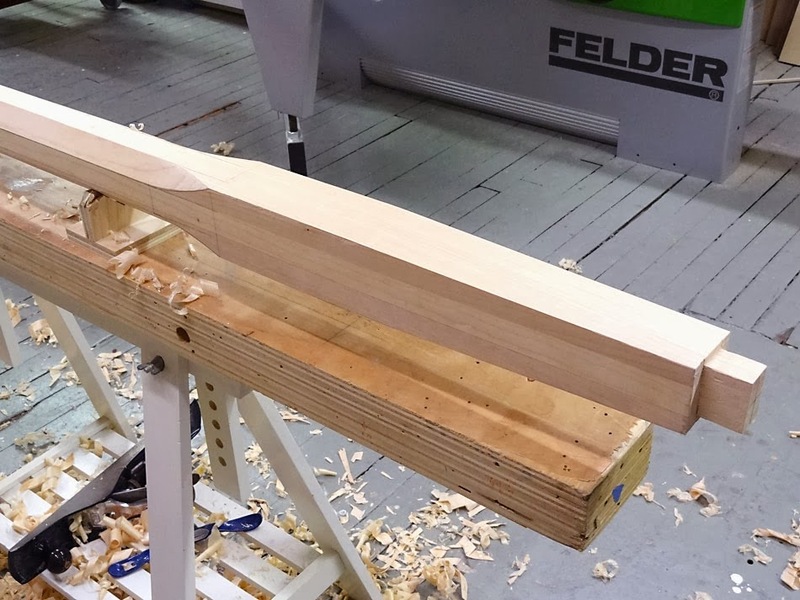 I cut close to the lines with a drawknife, then finished up the flats with a plane, working the scalloped bits with a spokeshave. The sixteen siding I did by eye, just striving to keep the flats equal in width. I cut close to the lines all around with a drawknife. This is how I transitioned fro round to square. At the same time that I was working the fore down to round, I was cutting the birdsmouth staves and gluing those up. 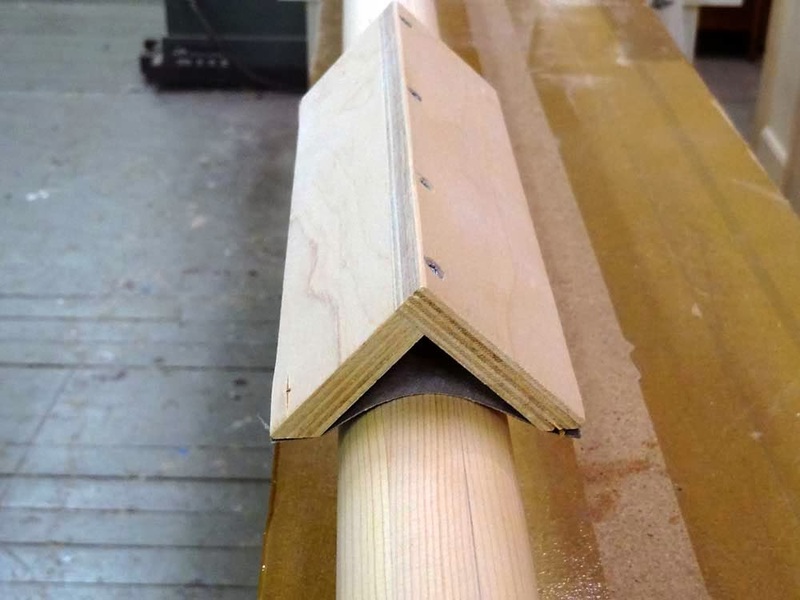 This method of spar building utilizes a formula to derive the stave widths and thicknesses for a given radius. 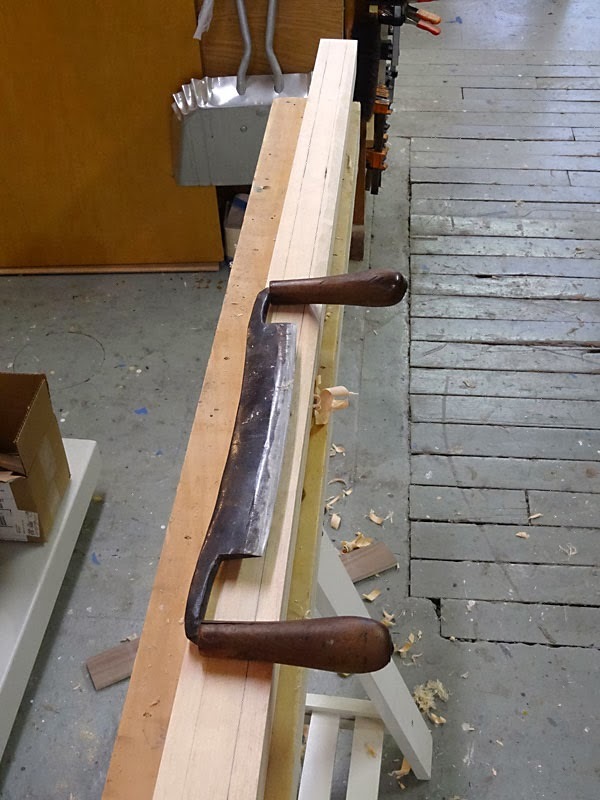 One edge of each stave is cut with a 90 deg. 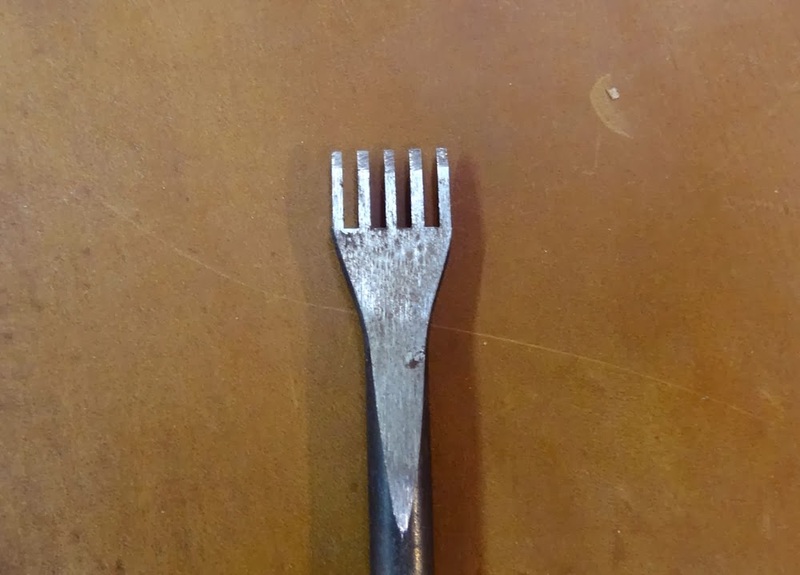 vee groove, and the other edge is left square. The taper is cut on the square edge. One stave of each spar is marked out, cut, and trued up with a block plane, then that stave is used as a pattern to mark the other seven. The vee groove is cut on the shaper. Using a tapered stave to mark the rest of the eight pieces. Three spars worth of staves. Each square edge nestles into the vee of the next stave, with eight staves making an octagon. 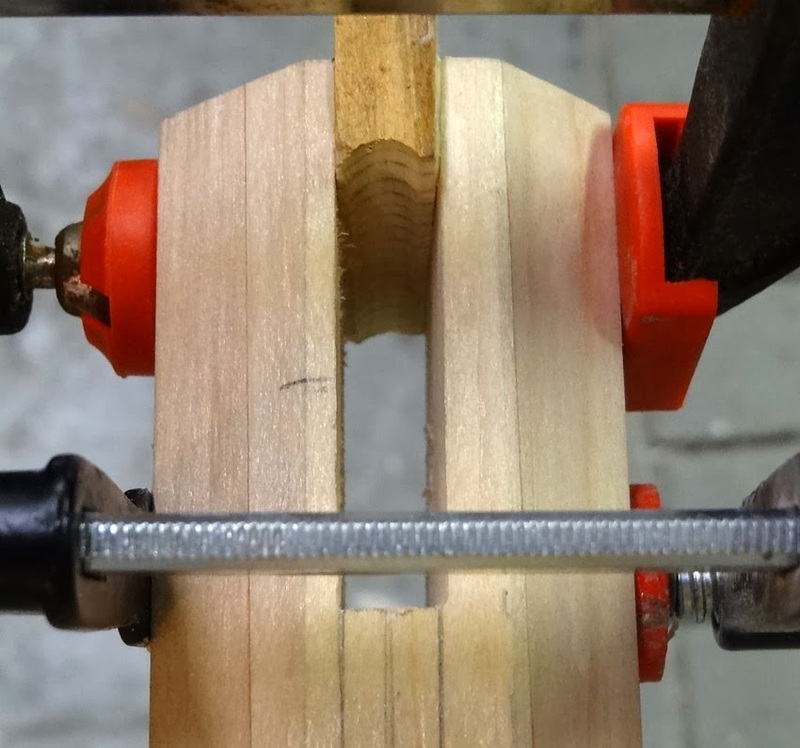 Glue is applied in each vee groove, and the spar is assembled and clamped with hose clamps. I then glued octagonal plugs in the ends of each stick, to close them off. Applying glue to all eight at one time. 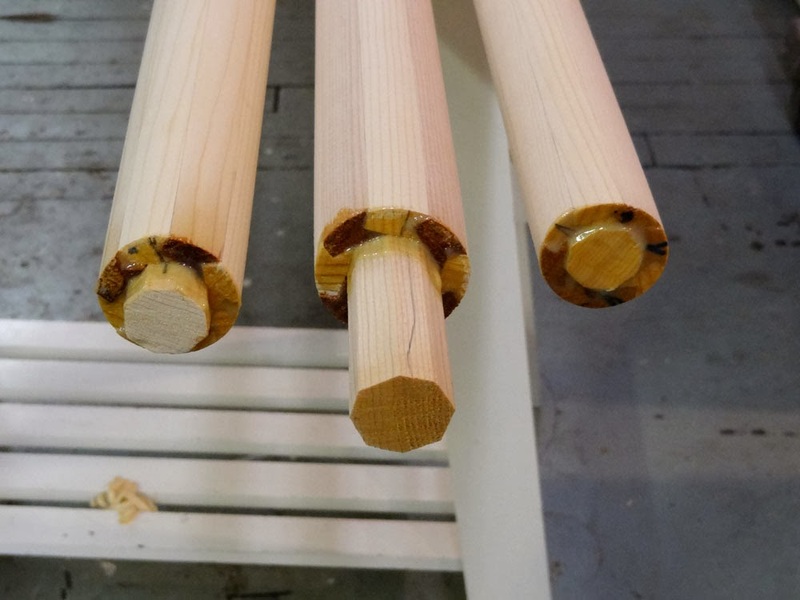 The staves are assembled, and secured with hose clamps. The hollow spars were sixteen sided just like the solid one, by eye. 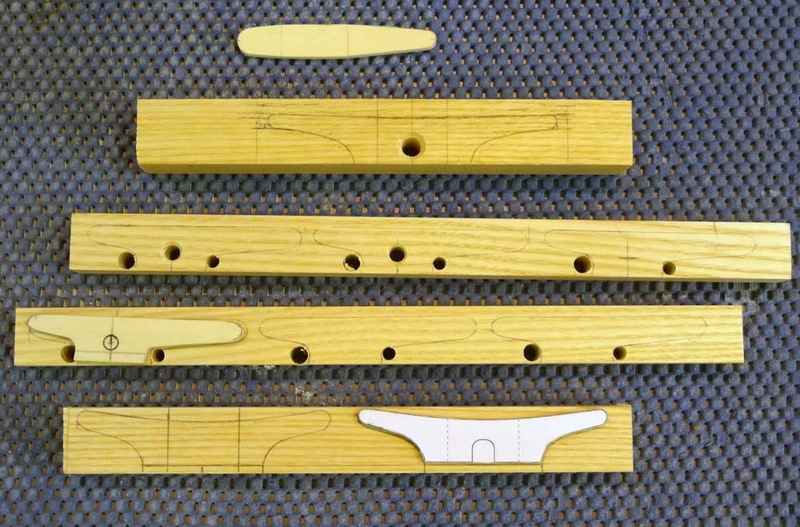 I keep threatening to make a set of spar planes, but I haven't done it yet. I ended up buying a nice radius spokeshave from Veritas, which fits every spar except the large end of the fore. This shave worked great on the spars, as it will on oars as well. It's a very well made tool that makes truing a round much easier. For sanding, I used a trick that I picked up from the WB forum, probably from Clint Chase. 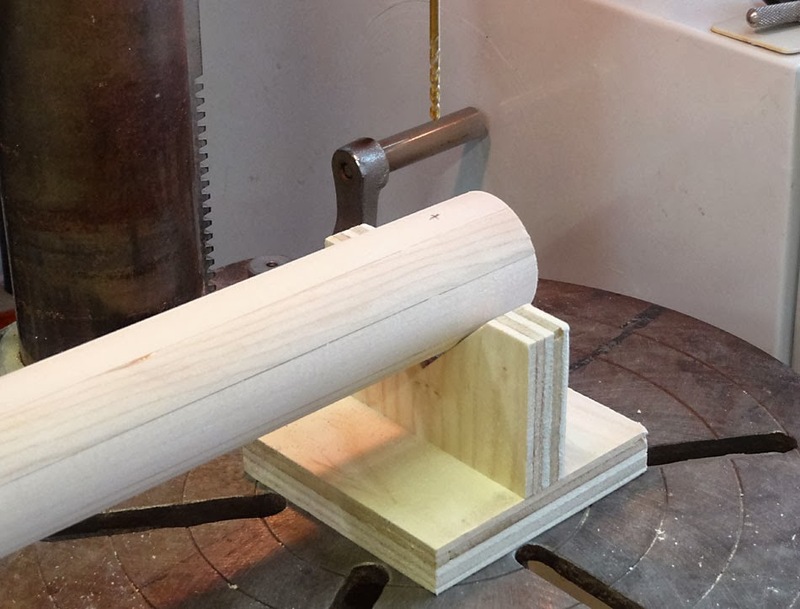 I made a box sander from plywood and a sanding belt that conforms readily to a changing, round shape. I made an 80 grit and a 120 grit box, then finished up with some 180 grit by hand. 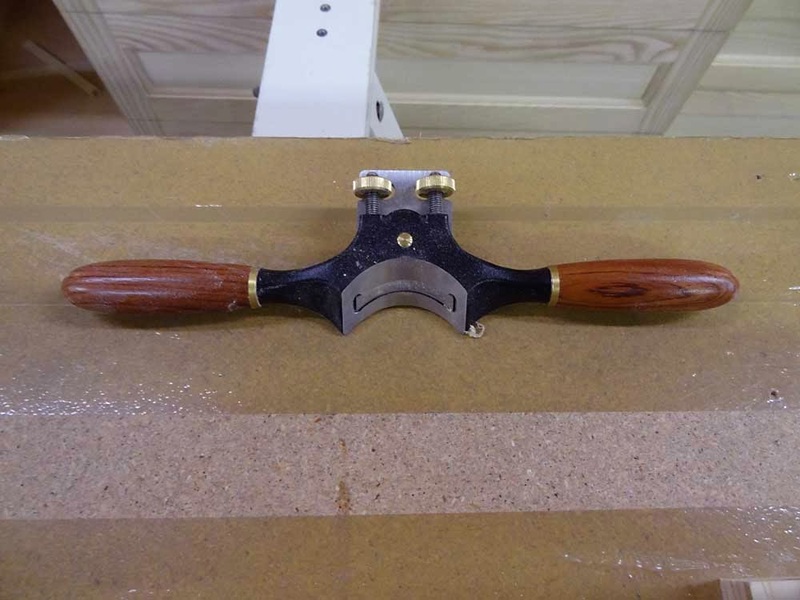 My radius spokeshave. An excellent tool! 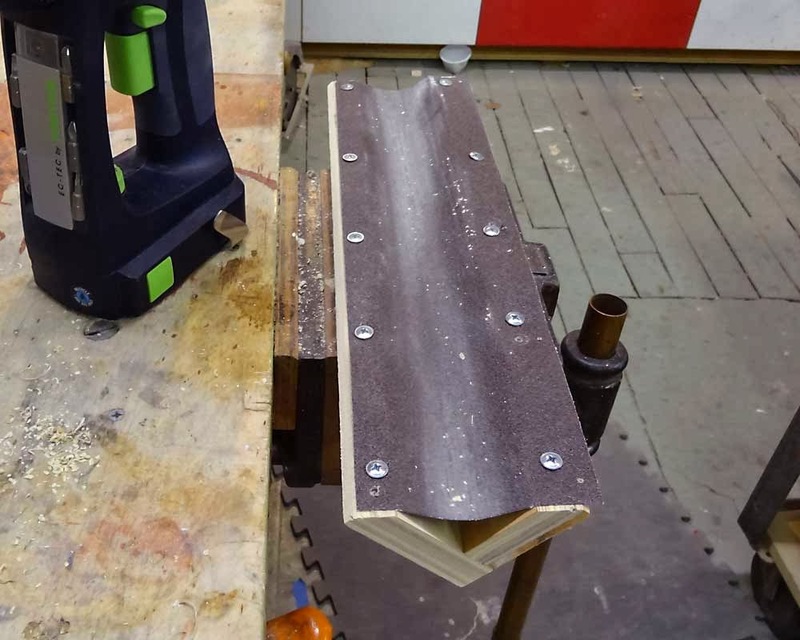 Flexible sanding box. I got the idea from Clint Chase and Steven Bauer. It conforms to a changing diameter easily. 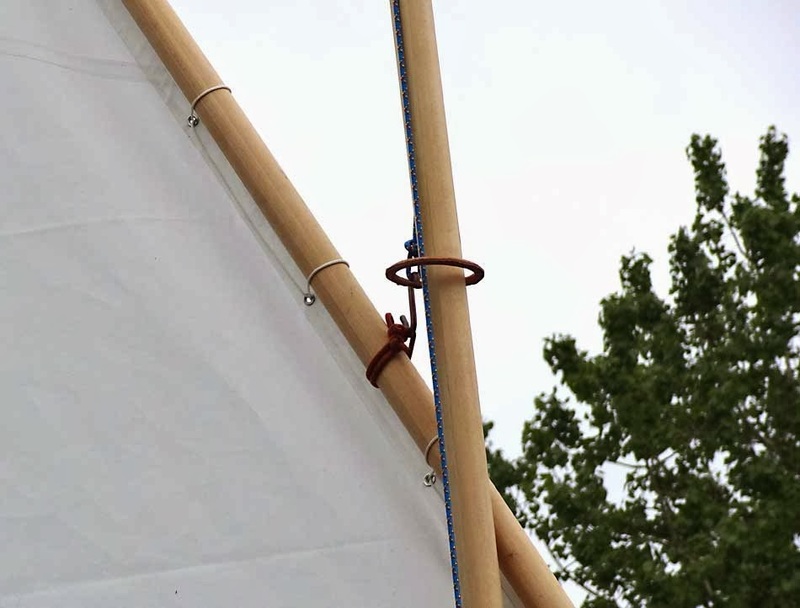 The fore mast has a sheave for the halyard, let into a through mortise at the mast head. Rather than chop a mortise though, I cut a "u" shape in the top, then glued in a block to close the box. Easier than chopping by far. The sheave pivots on a brass rod driven through the mast. 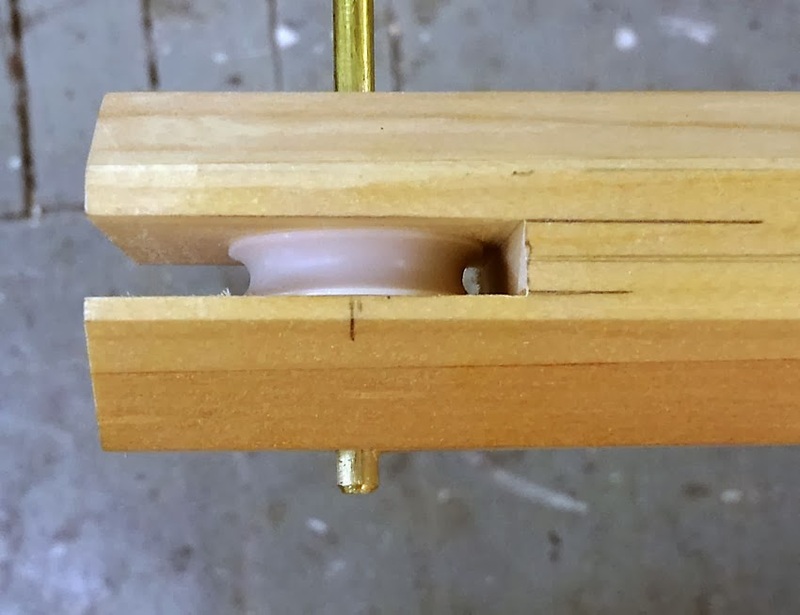 Fore halyard sheave fits into a "u" shaped mortise. The top is closed off. The mizzen utilizes a "dumb sheave" for the halyard. This is just a hole drilled in the mast head to take the halyard. That sail lives on the mast. The halyard is there just to allow reefing, so it doesn't go up and down much. The set-up for hole drilling in a spar. This is the fore boom, I believe. I drill a small pilot first, then come in from both sides with a larger bit. 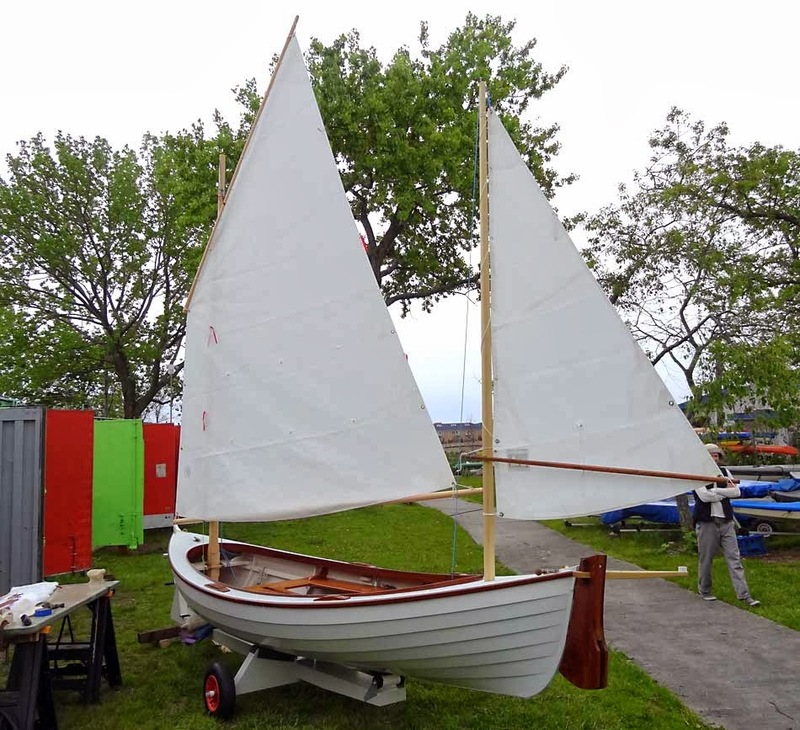 After sanding all the spars, I put on a sealer coat of shellac to keep them clean, then headed out to the club to set up the sails for the first time. 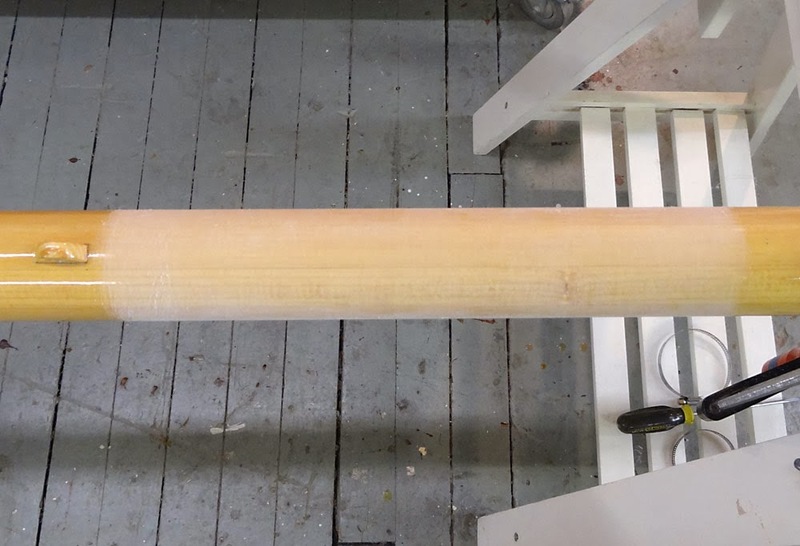 Spars are shellacked to keep the dirt off 'til varnishing time. Next time we'll set up the rig! It must be the time of year, but January often brings up a need to update this blog! 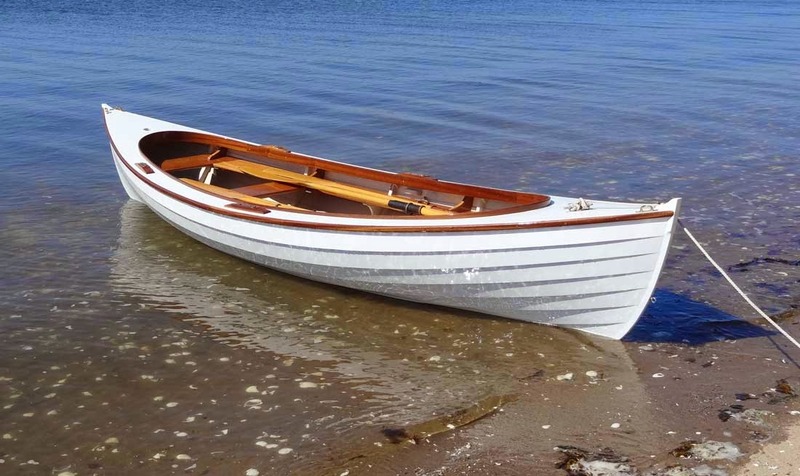 The boat has been finished for a while now, and rigged and sailed and rowed, though not exhaustively. 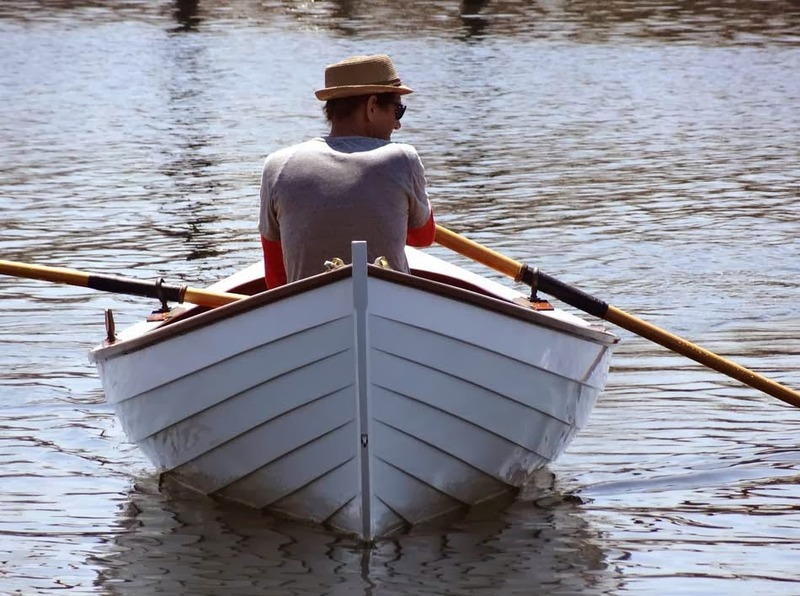 I'm looking forward to the coming season, and to spending a lot more time sailing the boat. 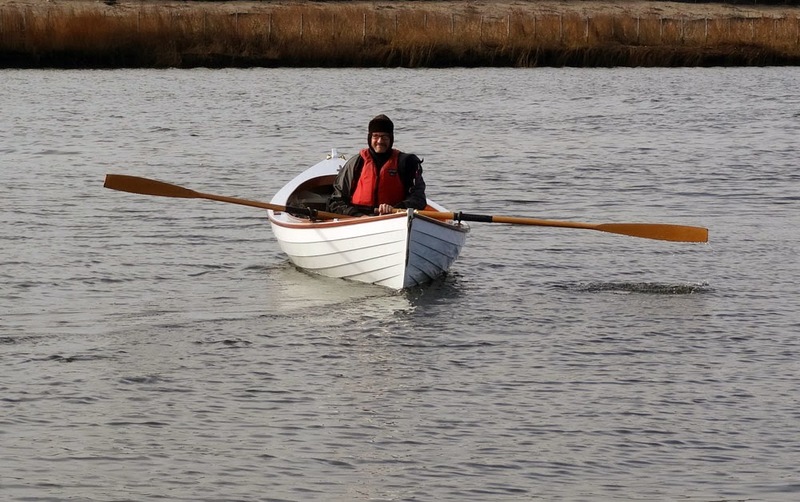 On New Years Day, I got out for a row. A shortish one in the 20 degree weather, but I made it out to the daymarker and back, about 3 miles. Enough for a cold day. Bundled up on New Years Day. One more swing past the dock before heading out. The foils were cut out, shaped, and sanded. I next cut strips of glass on the bias to wrap the leading edges (easier around the curves than 90 deg. tape), putting on a couple of layers for protection on grounding. 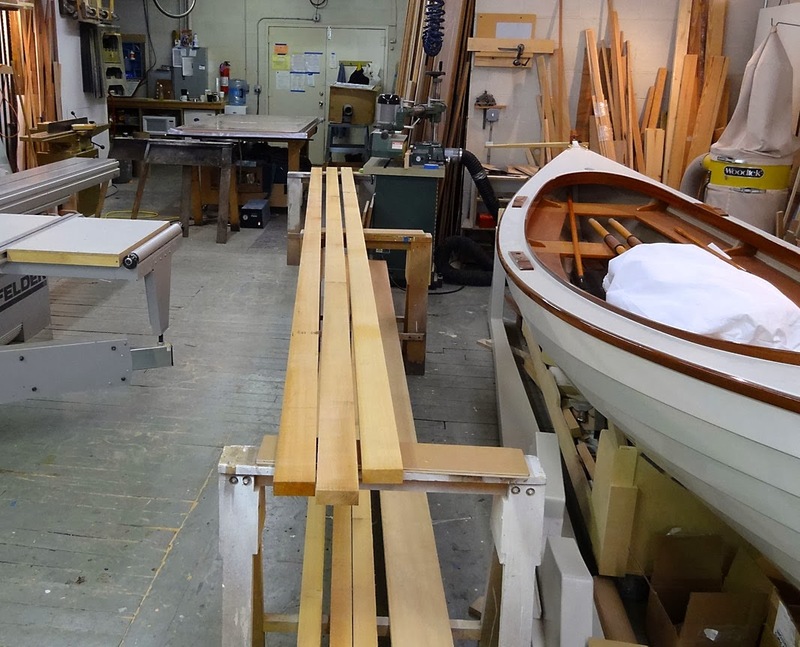 The daggerboard in particular needs to be rugged, and the wood (spanish cedar) is soft. The rough glass edges were smoothed, and then a whole piece of cloth was cut to shape and applied to each face of both foils. 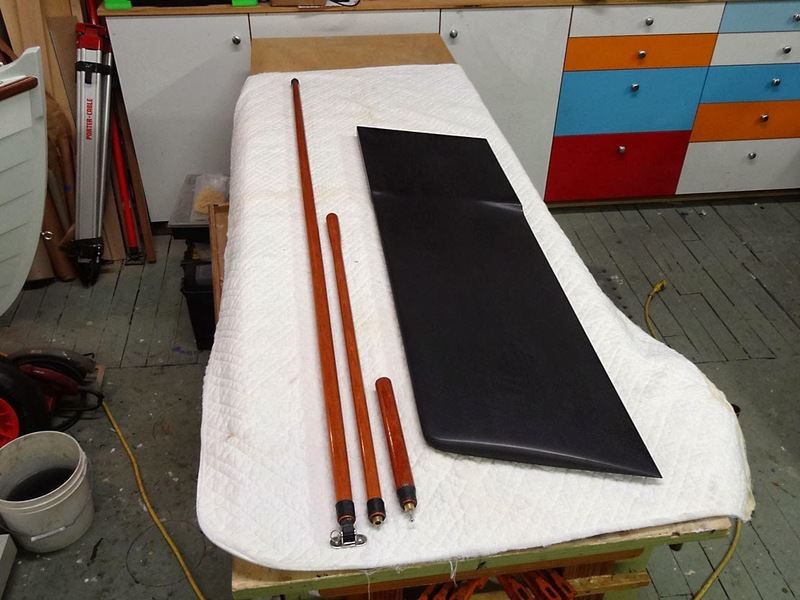 I've been graphite coating foils for years, to good effect, so I did this daggerboard as well. I painted the rudder blade though, because I didn't want a black blade spoiling the paint scheme. 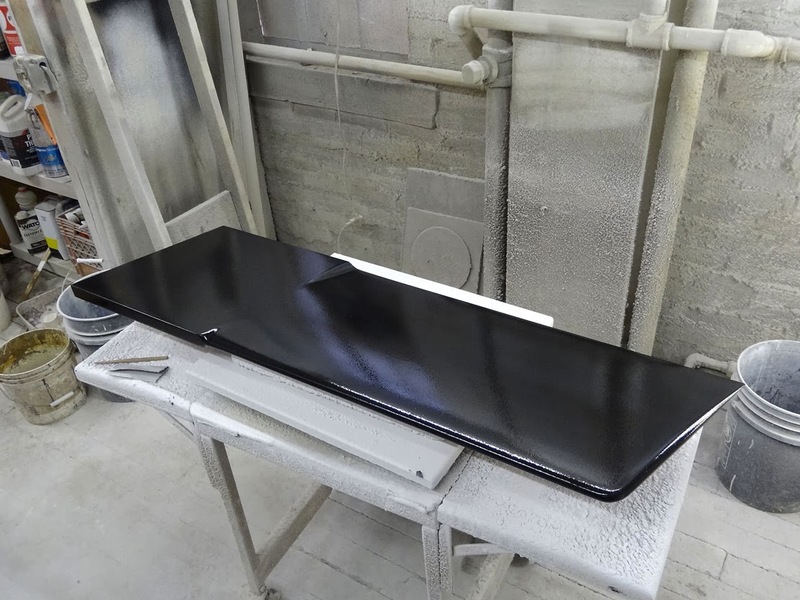 The trick to graphite coating is to mix plenty of powder into the epoxy so that it's consistently dark enough, and I usually apply two coats as well, sanding in between. It's a little messy to sand initially, at least dry. I use a random orbit with 100 grit dry at first to smooth things out, re-coat, then switch to wet abralon pads, 220 through 1500. There's often a little sand through in places, but I leave those alone. The graphite/epoxy produces a very tough, durable surface that holds up for years, and is easy to touch up if necessary. 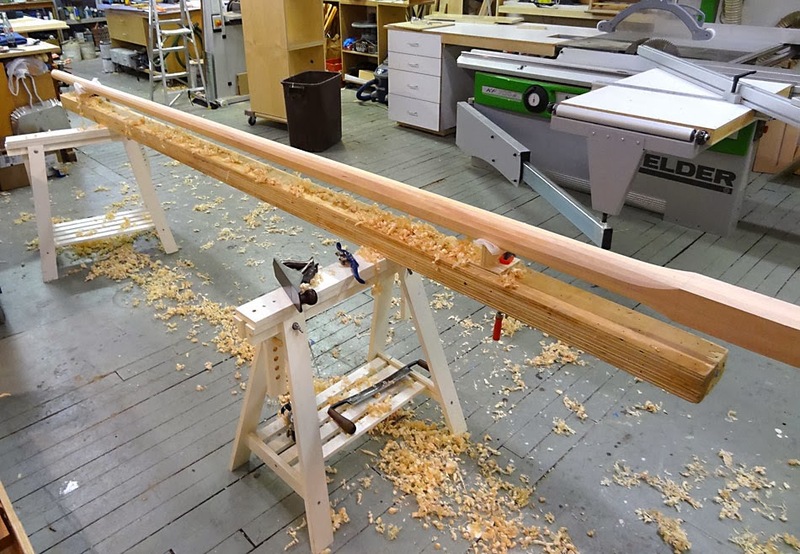 The coated daggerboard, before sanding. 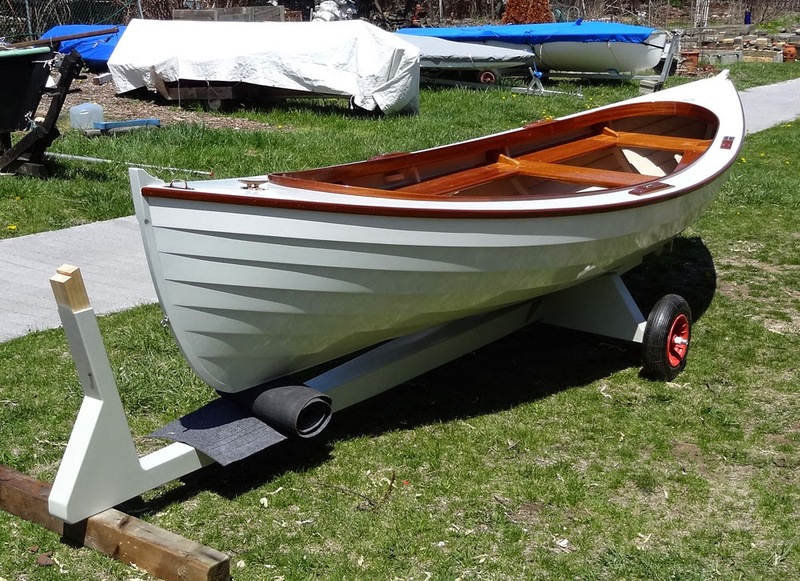 The finished daggerboard, plus varnished tiller and extensions. All that remained now were the sails and spars! I decided to go ahead and get the boat out of the shop. 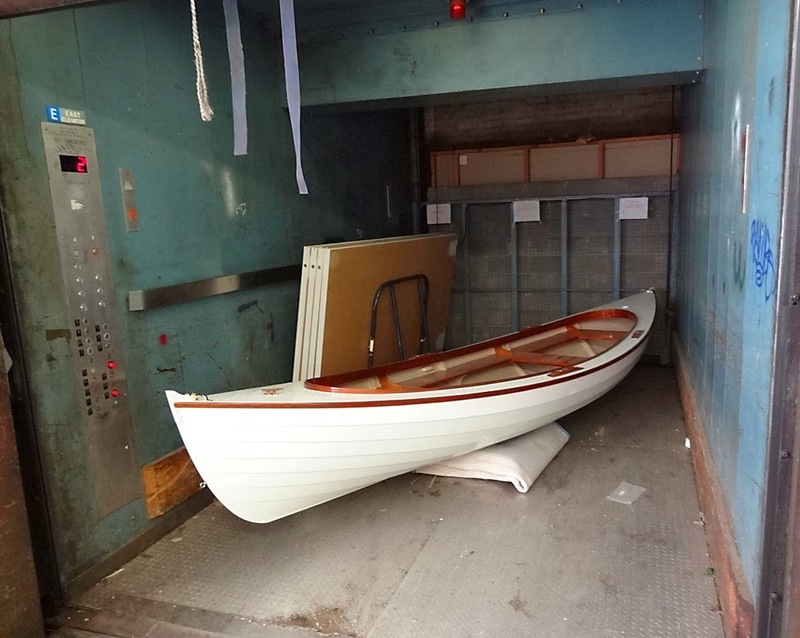 It was rowable at this point after all, and I needed the shop space to glue up the spars, so I called Marco, my mover, plus Matt and Chris to help with the big move. 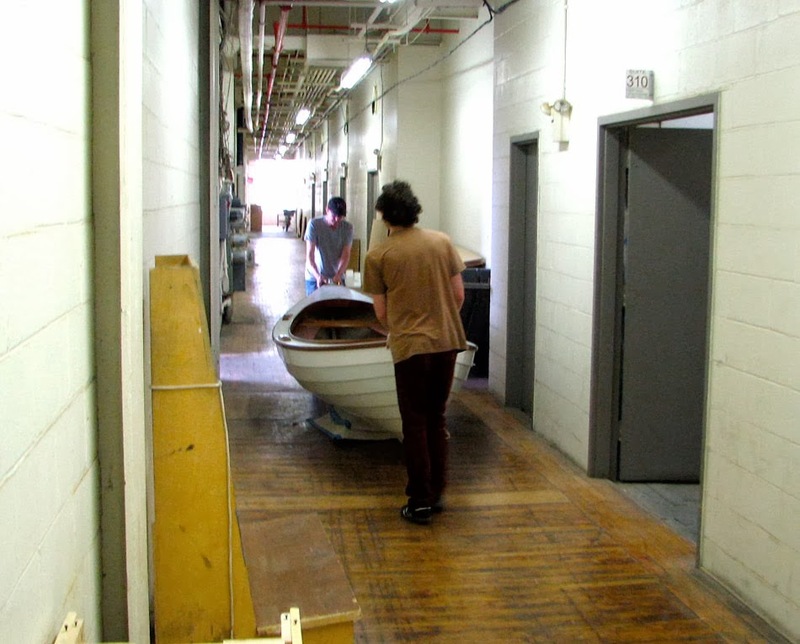 It's pretty exciting stuff, moving a boat out of the shop for the first time. My situation is a little different than most builders, in that I have a long hallway and an elevator to negotiate! But the elevator is huge- it's an industrial building with a real loading dock. We were actually able to roll the boat out of the door, by setting her on her bilge on top of two carpet dollies. Then we rolled her on down the hall and into the elevator. She rolls easily on a carpet dolly. Matt and Chris ready to load the truck. Mouse is light enough to be handled easily by two or three people. Two can pick her up for a short time, but four is better for carrying without wheels. At any rate, she went right in the box truck, with her nose poking through the gate up in the cab. We were even able to close the roll down door! Mouse and crew made quite an appearance at the club that day, with plenty of hands eager to help put her on her dolly. Launch day was an event too. It actually took another week to get the dolly finished up with rollers and winch, ready to launch. We had a good spring day for it- warm with a pretty light southwest breeze. Mouse looked right pretty tied to the dock, sitting on her lines perfectly. I expected her to have quick motion, with that deadrise and high bilge. 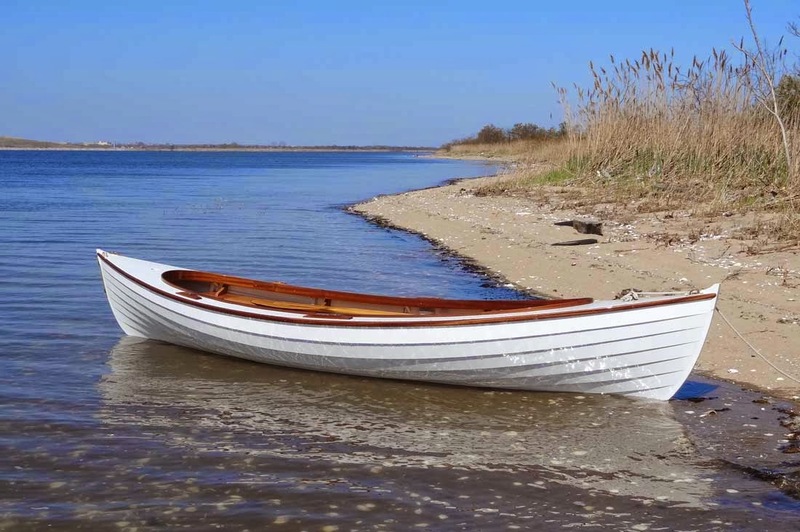 I wasn't foolish enough to try stepping onto her side bench, but like a canoe, stepping into the middle with a hand on the gunwale does the trick. Once settled down, her motion is fine, and man she's light as a feather with one aboard. 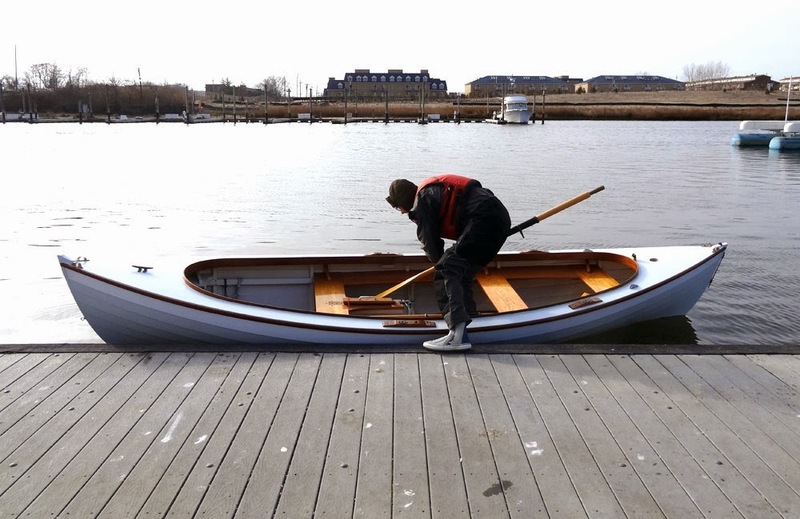 Rowing from the aft thwart feels effortless! 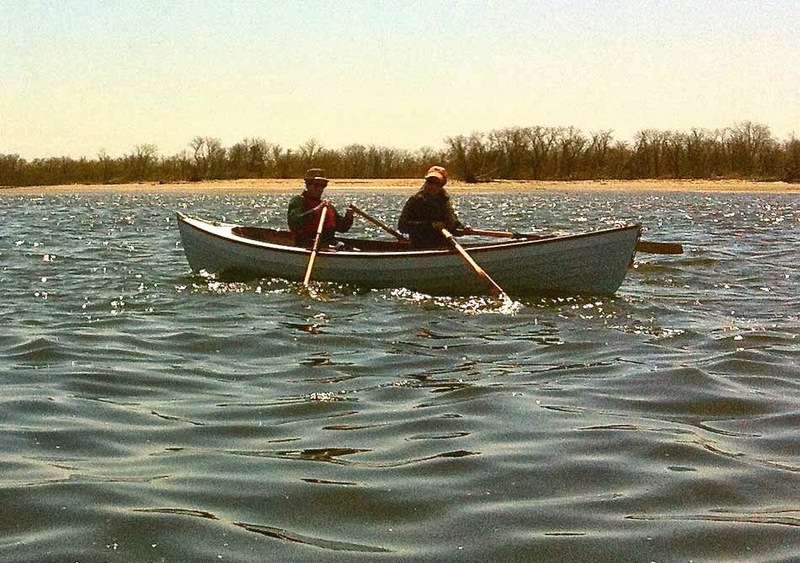 I rowed around a bit, then Holly and I took off together, with me rowing from the forward thwart at first, then both of us rowing together. Holly rows from the forward seat. From forward with a passenger. 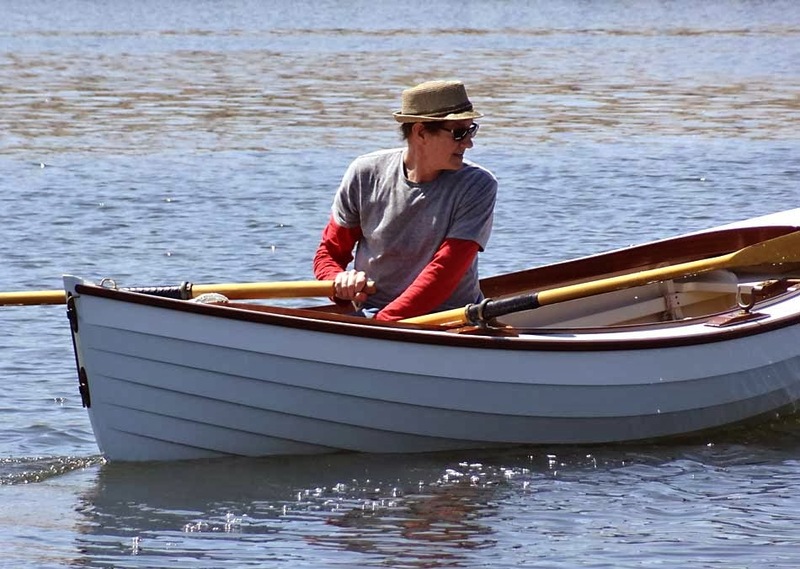 Over the next few weeks, I rowed out to the islands a few times, getting a feel for the boat in wind. She seems to like me in the aft position most of the time. In a quartering breeze, she wants to round up-that seems to be her toughest course. Beam to is fine, tracking well even if making some leeway. She is light after all. But I was very anxious to get the sails up, and tried to stay in the shop to get those spars done. I'll cover that next time. Thanks to everyone for looking at this blog!